For the price of the Iraq War, we could've bought enough pecans for a pecan pie the size of West Virginia. About 5 ounces of pecans are necessary for a 9-inch pie. 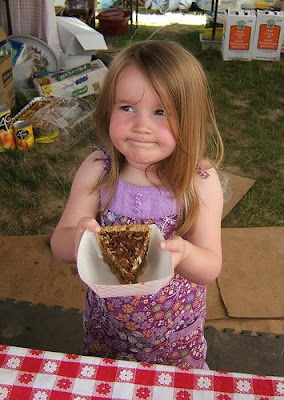 A 9-inch pie is about 64 square inches in area, so each ounce of pecans is worth about 12.7 square inches of pie. (There are about 4 billion square inches in a square mile.) West Virginia is 24,230 square miles, or 96.9 trillion square inches. At Surratt Farms, 30 pounds of pecans can be purchased for $157.50. Buying enough pecans for a pie the size of West Virginia would cost $2.65 trillion, which is $350 billion less than Joseph Stiglitz and Linda Bilmes' estimate of $3 trillion for the total cost of the Iraq War. Image used under a Creative Commons license from tonythemisfit.